On a remote military base in Afghanistan, after days of fighting, soldiers are running perilously low on ammunition. Replenishing their bullets will be incredibly difficult. Roadside bombs put truck convoys at peril, and the presence of the Taliban makes it exceptionally dangerous for any air crews to approach. Even so, a helicopter appears on the horizon, bringing several thousand pounds of supplies. The ammunition is gently lowered onto the ground, and no pilots are harmed. In fact, the pilot’s seat is empty. These supplies are delivered by drone. When you think of drones, maybe you imagine a future Amazon quadcopter dropping a package onto your front lawn. Or perhaps you recall headlines of drones capturing photos of celebrities for paparazzi. Or maybe you imagine a scene like the one in Afghanistan, which actually happened in 2011. The U.S. Marine Corps deployed the first unmanned K-MAX helicopter in Afghanistan. That helicopter followed a programmed flight path using GPS coordinates logged in by humans, just as an Amazon quadcopter would do. But imagine an automated aerial vehicle that can survey an area, plan a safe flight path, and land without any assistance from a human operator. That’s what Sanjiv Singh has in mind. The research professor at Carnegie Mellon University’s Robotics Institute, part of CMU’s top-ranked School of Computer Science, is also cofounder and CEO of Near Earth Autonomy, a company that makes software and designs sensors that enable aircraft to perceive the world around them. The technology he is developing goes far, far beyond the drones hovering around us today. In fact, Singh likes to say that he doesn’t work with drones at all; rather, he works with unmanned aerial vehicles (UAVs). Singh and his team aim to autonomously fly full-sized, unmanned helicopters. They fly the helicopter via remote control—and most people still think of drones as operating this way, much like remote-controlled cars of childhoods gone by. But those vehicles weren’t smart, Singh notes. “If you aimed your car at a wall, it would keep right on going.” Similarly, in the case of drones, a remote pilot can point the craft to fly to a certain destination, but if there’s an unexpected cell phone tower along that route, the craft might crash. To understand what Singh and the researchers at CMU’s Robotics Institute are working on, he says it’s helpful to think of self-driving car technology by the likes of, among others, Google, Nissan, and Uber (each of which has members of the CMU community at the forefront). As an example, he points out that it’s imperative to make sure a self-driving car, traveling at the speed limit, doesn’t crash into a slow-moving truck just ahead. That circumvention, Singh says, is what he’s trying to make in the air. He hopes that people will see UAVs as something beyond a simple remote-controlled craft. Drones fly blind, but his aircraft are flying with situational awareness. In other words, a drone could easily collide with a tree, but Singh’s automated aerial vehicles would know to swerve. Singh didn’t fly remote-controlled helicopters before he came to CMU in 1985. In fact, when he started, he focused on ground robotics. But then in the late 1990s, he began to apply similar technology in the context of an air vehicle. At the time, not too many people were working in the UAV field; Singh made it his mission to stay ahead of the curve. He cites the 2007 Defense Advanced Research Projects Agency (DARPA) Urban Challenge as a pivotal moment. He worked closely with the CMU team that won first place for its modified GM Chevy Tahoe called “Boss.” They beat 11 other teams and took home a $2 million prize for enabling Boss to successfully navigate a 60-mile course, making “intelligent” decisions about obeying traffic laws and avoiding other vehicles. The team’s demonstration significantly exceeded the state of the art. It just so happened that soon after the DARPA Challenge, the U.S. Marine Corps put out a Universal Needs Statement to develop a cargo UAV capability. It was 2008, the war had been going on for several years in Afghanistan, and the Marines needed an aerial vehicle that could deliver even in hazardous territory. They needed that unmanned helicopter to appear on the horizon. Meanwhile, Singh had been working on autonomous capabilities in collaboration with the Piasecki Air Corporation and an Army-funded research team. While drone hobbyists were flying seven-inch helicopters in the park even back then, Singh’s team was aiming to autonomously fly full-sized, unmanned helicopters. In 2010, utilizing some of the same technology that won the DARPA challenge, the team landed the first autonomous rotorcraft. The vehicle was given the coordinates of a casualty, and it proceeded to that location and found a good place to land. Enter the Office of Naval Research (ONR). Soon after the success of the autonomous flight, ONR awarded funding to Singh’s Near Earth, as part of for the Autonomous Aerial Cargo/Utility System (AACUS) project, which was to develop autonomous aerial vehicles as a cargo-delivery system. Much as an Amazon drone might someday land a novel in your front yard, AACUS would deliver 5,000 pounds of anything from bullets to batteries to water in a military theater, delivering cargo without the use of a human pilot. That’s the most dramatic benefit of AACUS: saving lives. No need to worry about improvised explosive devices blowing up a truck convoy or enemy fire attacking human pilots. No need to worry that a pilot will lose control in unexpected bad weather or low visibility. What’s remarkable is that anyone can use AACUS without specialized training. During 2014 tests at the Marine Corps base in Quantico, Va., operators with no pilot or flight-control experience were able to supervise AACUS with a tablet based application following minimal training. This ease of use reduces the need to provide the sophisticated training that is generally required for air vehicle operators. “We work on basic technologies,” Singh says, enabling a rotorcraft to take off and fly from A to B to C and back to A. The trick, though, is that the craft has to fly “out of line of sight.” Pilots do not rely on seeing the helicopter in the air or on a screen; they are no longer in the picture. Singh calls it “basic” technology, but Max Snell, the AACUS program manager at ONR, is quick to point out that Singh’s work with Near Earth Autonomy and CMU is groundbreaking. “What they’re doing has never been done before,” Snell says. Without the innovative perception systems created by Singh and his team, these helicopters could much more easily slam into obstacles, just like children’s remote-controlled cars. So what will the UAV applications be? Many will involve tasks that are dull, dirty, or dangerous. Max Snell at the ONR is enthusiastic about the possibilities. He cites the example of oil platforms in the North Sea, where UAVs might deliver supplies when conditions are hazardous. The K-MAX helicopter flew successful cargo missions in Afghanistan for three years; at some point, perhaps AACUS will pilot the helicopter that appears on the horizon when ammunition is low. 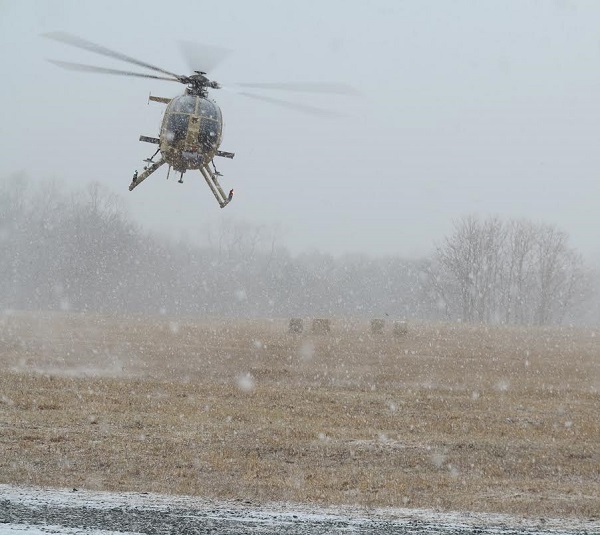 One day, an unmanned helicopter could also fight fires, delivering water when visibility is limited. UAVs might also provide rapid aid and relief supplies or evacuate people from remote or dangerous locations affected by disaster. UAVs could protect and tend to forests by distributing herbicides, pesticides, and fertilizers. Singh himself is working on another project funded by the Department of Energy’s Advanced Research Projects Agency-Energy (ARPA-e), in collaboration with Clemson University and the Donald Danforth Plant Science Center, investigating ways to help automate the growth of sorghum crops, which can be processed into biofuels. Every day at noon, for instance, a UAV might take off and make hundreds of measurements as it flies over 10 acres, providing data that farmers can then use to accelerate effective breeding and minimize disease. Agriculture, bridge inspection, construction—UAVs have already infiltrated many commercial arenas. Someone who is quite familiar with both the military and commercial sides of the coin is Michael Korman, CEO and chief pilot of Right Stuff Drones, Inc., in Minnesota. He’s also a retired Navy Master Chief Petty Officer who received a bronze star after four tours in Kuwait, Bosnia, Kosovo, and Iraq. These days he spends his time doing things like piloting his drone above the Mississippi River to provide video feed for a search and rescue operation. After 25 years of military service, now he’s eager to be part of this next wave in technology and thinks that within five years, unmanned aerial vehicles will be routine in firefighting and emergency response teams, even construction companies. He envisions every fire company using UAVs to detect roof hotspots or chemicals—in other words, because of “remarkable” research being done at places such as CMU, UAVs will save lives by providing situational awareness that was previously available only with great risk to humans. For now, though, all UAV applications are remotely piloted or programmed. But the civilian applications of these remotely piloted UAVs are rapidly developing. It’s a familiar pipeline: today we take for granted many things that were made possible through military research—GPS, digital cameras, duct tape. Even the microwaves we use to warm our coffee exist because of WWII innovations in radar technology. What was once clandestine military technology is on course to become integrated into daily life. The research continues. Just as the elevator has become an integral part of life, Singh believes that we’re reaching a “critical mass” in air vehicles. Truly autonomous UAV technology can enable a new wave of transportation. Singh envisions current work on autonomous flight paving the way to a flying car, perhaps a hybrid personal vehicle that would allow users to drive part of the way to a destination, then take off and fly. Think about it: If you don’t need to be a pilot to fly an aircraft, then why not adapt the technology to everyday travel? Singh himself does not have a pilot’s license, but he’s made a helicopter that knows how to fly on its own. Perhaps one day when we use an app to summon an Uber, it won’t be a car that appears, but a UAV. Then we’ll hop in and relax while we safely fly from New York City to Los Angeles.